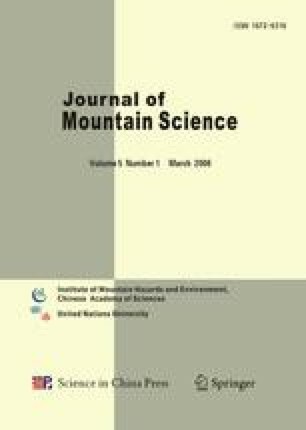 This paper highlights the quantitative estimates of plant species diversity and ecosystems of the Rohtang Pass, which is one of the most preferred visiting spots by tourists in Himachal Pradesh (H.P. ), India. In spite of high pressure of anthropogenic activities, the Rohtang Pass still harbours a variety of flowering plants with economic value, including various medicinal herbs. In order to observe species diversity in different landscape elements (LSEs), ground surveys were conducted in nine unique LSEs within the elevation range between 3624 m and 4332 m. Plant community structure in each LSE was studied using stratified random sampling where a total 56 quadrats of 1 m2 in size for herbs and 7 quadrats of 25 m2 for shrubs were made. Of the total 50 plant species belonging to 15 families recorded in different random quadrats, 24 species were found of medicinal value. Maximum species richness (18) and value of Shannon diversity (H′=2.2648) were observed on northeast-facing slope in Picrorhiza kurrooa dominated LSE in moist area, followed by Rheum emodi LSE (species richness = 17 and H′ = 2.4141) distributed on south-facing slope. Maximum values of species richness and Shannon diversity in Rheum emodi LSE were observed between 8 ∼ 12 and 1.4797 ∼ 2.1911, respectively. Rhododendron anthopogon dominated LSE on northwest-facing slope was found least diverse in terms of species richness where the Simpson index of dominance (D) was 0.4205. The species were equal in abundance in P. kurrooa LSE on east-facing slope and Pleurospermum candollii LSE on north-facing slope, showing the maximum similarity in terms of species distribution between the two LSEs. Low turnover of species across common LSEs gives an idea regarding their limited distribution. Five species of threatened category according to the IUCN criteria were observed in seven LSEs. The largest population of threatened medicinal plants was recorded on northeast and northwest-facing slopes where population density of Bergenia stracheyi (29.25 individuals/m2), Picrorhiza kurrooa (19.83 individuals/m2) and Rhododendron anthopogon (26.23 individuals/25m2) was highest. Aconitum heterophyllum was recorded for the lowest density (1 individual/m2). It was observed that the distribution of medicinal plants was very habitat-specific. Lower soil pH in most of the LSEs reflected its acidic nature. A significant positive correlation of Shannon diversity was found with soil organic matter, carbon content available and total nitrogen. Considering the continuous pressure of anthropogenic activities, this paper suggests effective ecotourism planning and plant conservation mechanisms to protect valuable plant bioresource at the Rohtang Pass. TIES (The International Ecotourism Society). 2006. http://www.ecotourism.org/index2.php? What is ecotourism?